We all know that Polly loves fun, adventure, and travel! Recently, she learned about geocaching and decided to roll all of her interests into one. Geocaching is a game of hiding and seeking treasure, using GPS technology. The game is played all over the world and is a fun way to use technology while enjoying exercise and the outdoors. A geocache is placed by a geocacher who then pinpoints where it is using GPS technology. The location of the geocache is then put online for others to try to find. They can range in difficulty from very easy to very difficult and come in all shapes and sizes. 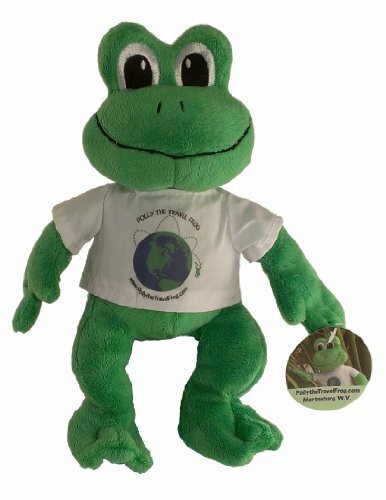 It can become very addictive for geocachers and many have either hidden or found hundreds of caches. The rules are fairly simple, but basically if you take something out of the cache, you should replace it with something and also log in the included logbook that you were there and found the cache. Another aspect of geocaching is the use of trackables. One type of trackable is a Travel Bug, which is a trackable that moves from place to place and is usually on some type of a mission. When you find a trackable, you should try to accomplish part of the mission and document what you’ve done to help it achieve it’s goal. Debbie and Candee thought it would be fun to send two Polly’s on an adventure with a trackable Travel Bug. Polly the Travel Frog-Team Ellen wants to be placed in the hands of Ellen Degeneres before Polly the Travel Frog-Team Oprah can be placed in the hands of Oprah Winfrey! Both teams started in the same cache in Martinsburg, West Virginia on Sept. 26, 2010. The Race is On! Go! Go! Go! 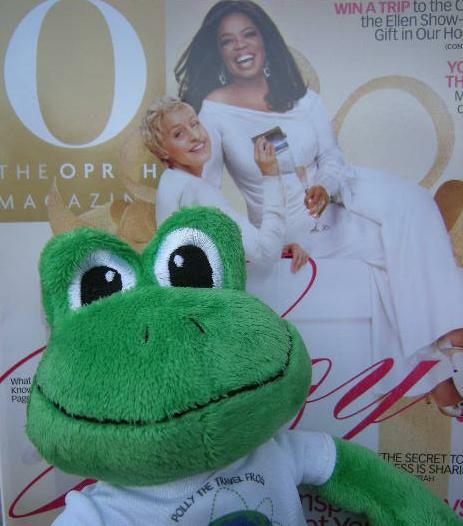 Polly from Team Ellen would love to dance on Ellen’s show and who knows, Oprah may have a fresh new face to put on the cover of one of her magazines! Oprah and Ellen? I think Mel Gibson and Russell Crowe would be more dangerous and exciting! Polly-Team Ellen is on the move! She was just found in ExploreWV Geocoin Challenge #11 – Ice Mountain by a team of cachers named, grandfolks. I wonder where they’ll take her next? Polly-Team Oprah has been picked up out of our cache but hasn’t moved yet! The race is on! Go! Go! Go! 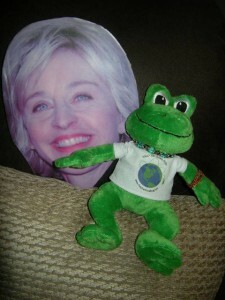 Polly from Team Ellen is on the move again! She has moved a total of 469 1/2 miles and has now been stashed in a cache in Lima, Ohio! She’s getting closer and closer to her goal! Polly from team Oprah, on the other hand, has stalled out! She was taken from the cache but hasn’t moved yet! I can’t wait to see the outcome!